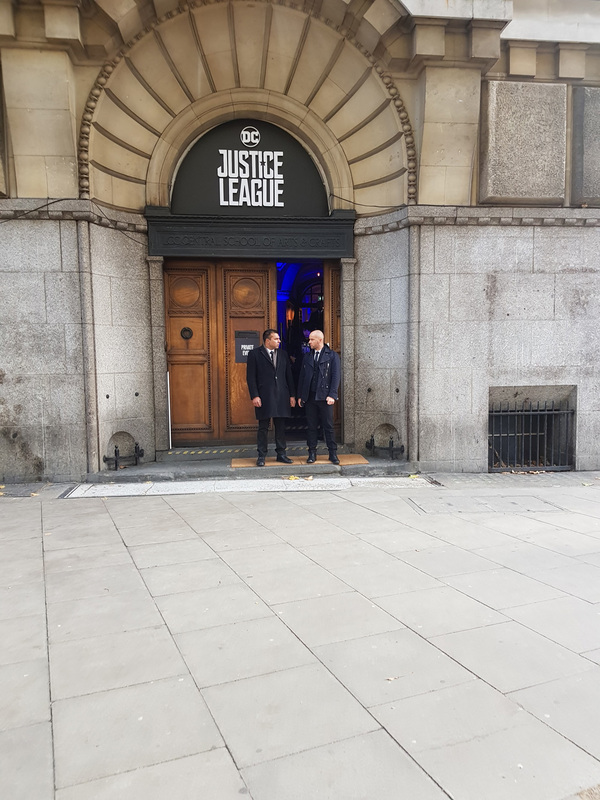 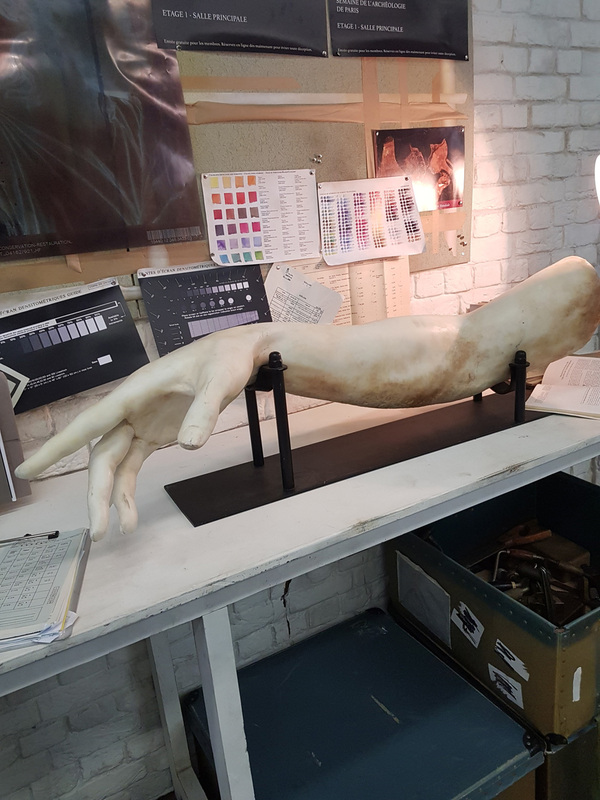 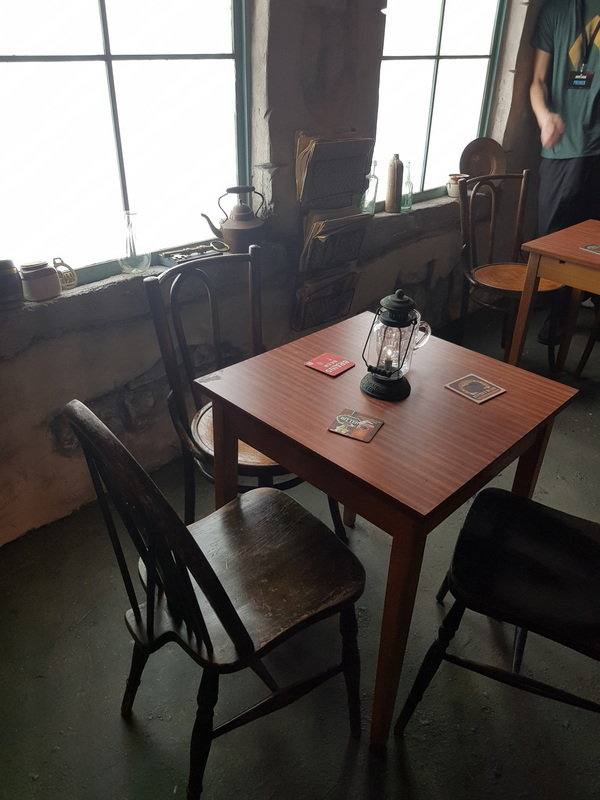 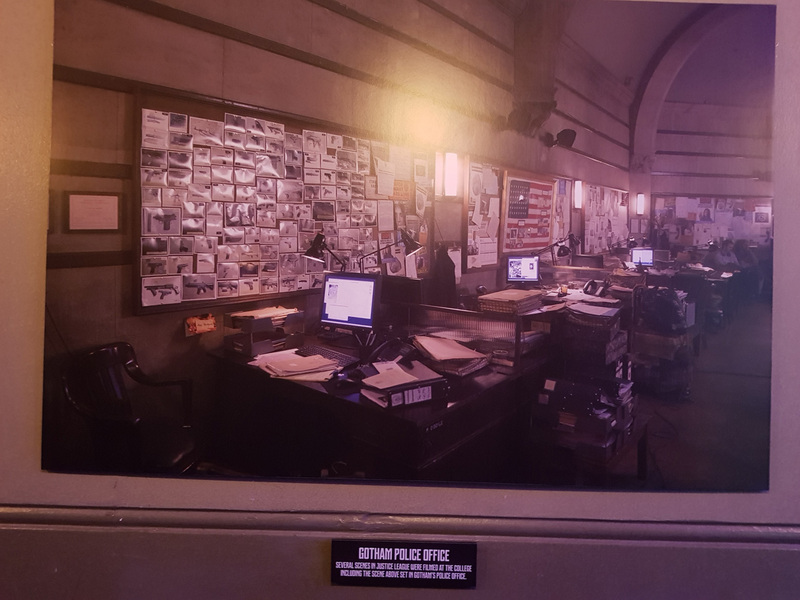 First of all thank you to The College, London, ShowFilmFirst and the Warner Bros UK team for allowing us access to the set pieces and props. 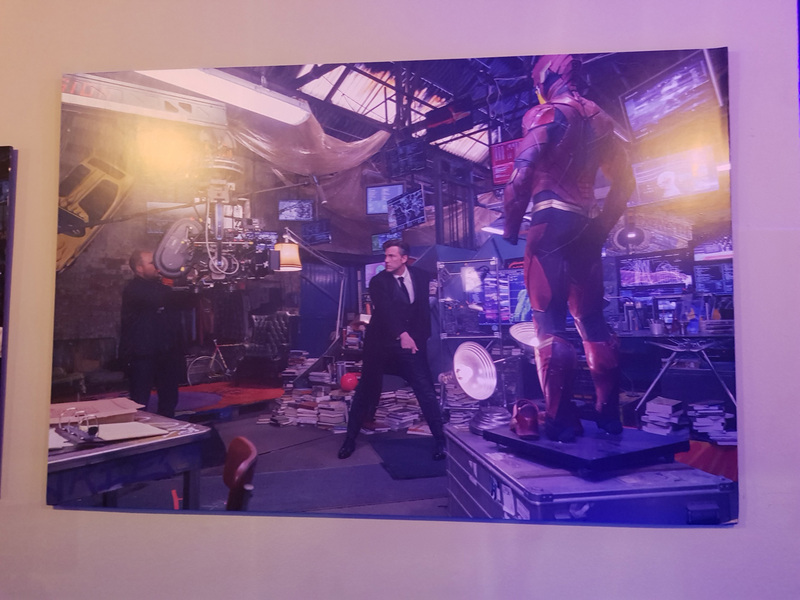 It is more a visual feast so be sure to savor the photos but yes, everything, everything you see, was in the film. 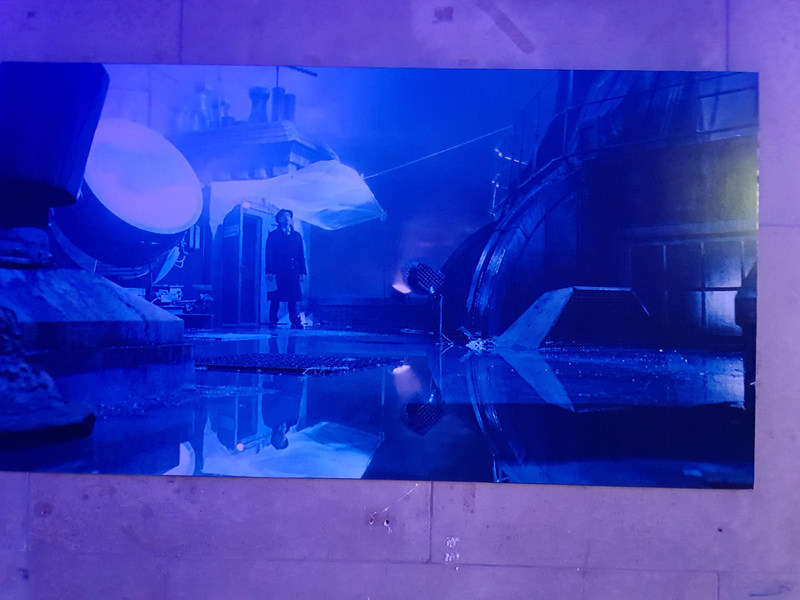 As I enter the building I was greeted by a montage of video clips from the film and some of the atmospheric soundtrack. 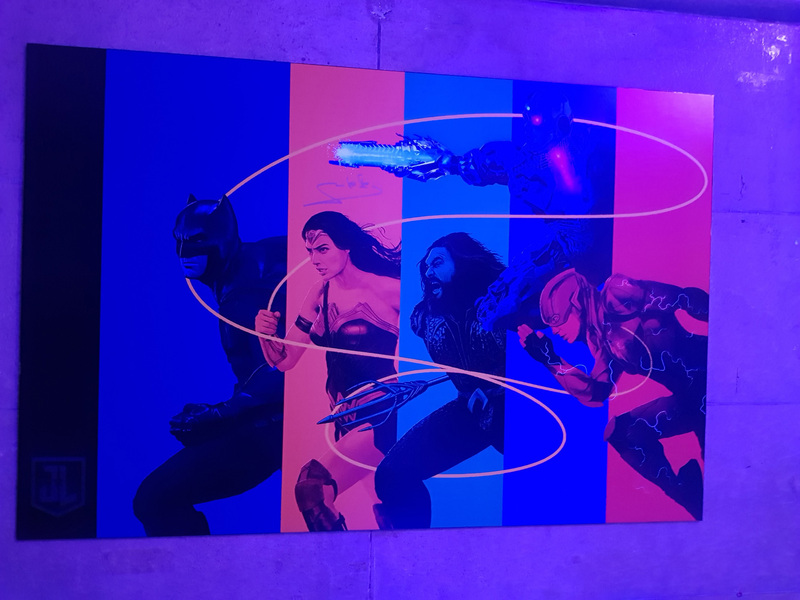 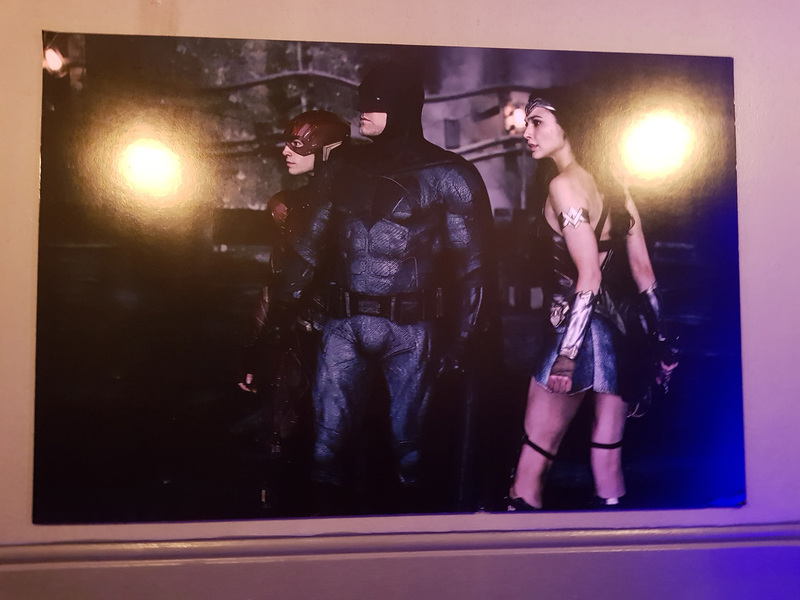 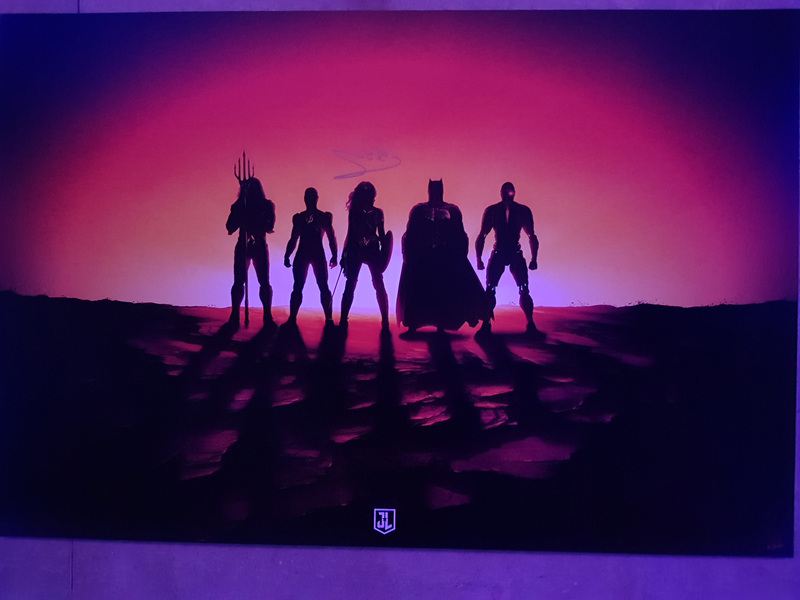 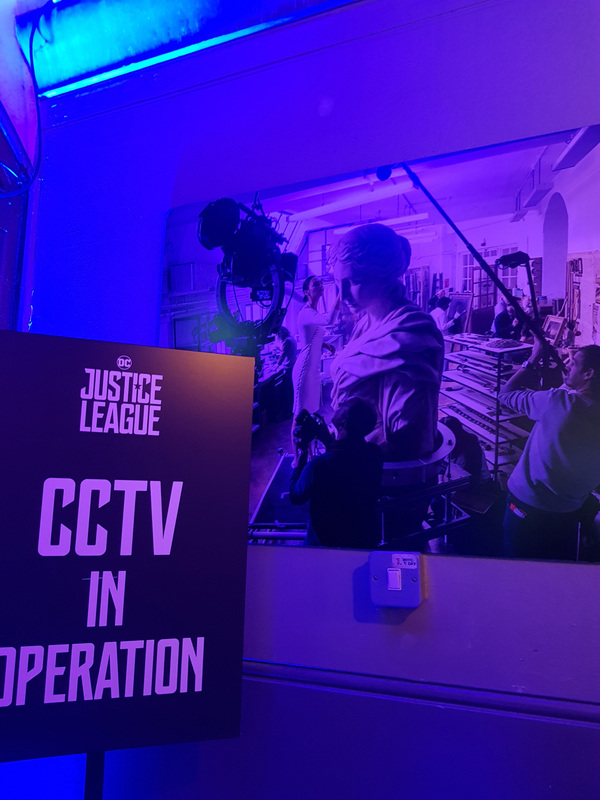 The walls are adorned with behind the scenes stills, and spotlights pan the rooms with each League member’s symbol. 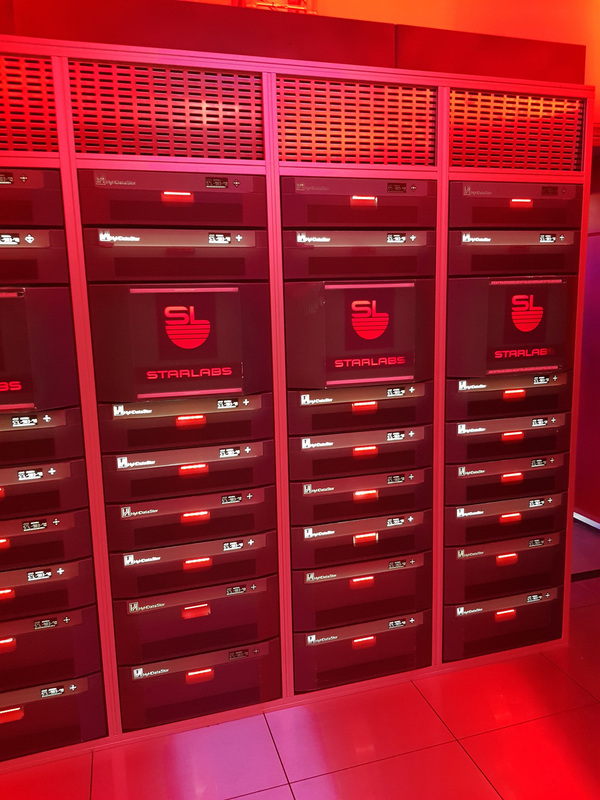 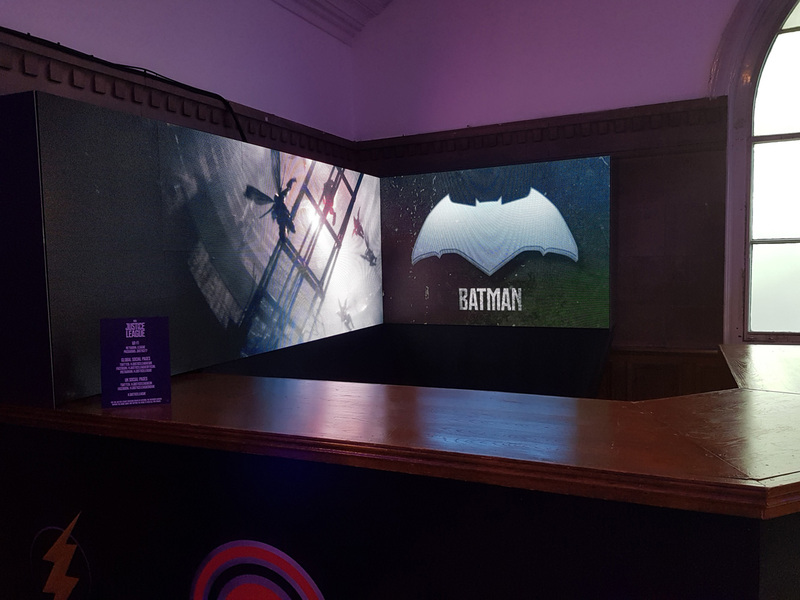 As I’m signed in, the concierge advises that there is an easter egg inside that only Superman fans will be able to find… we’ll come back to that. 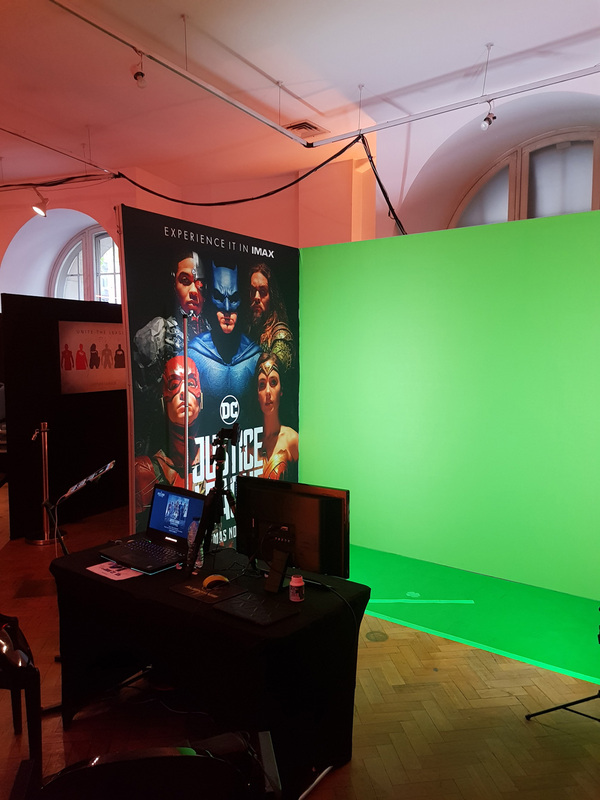 The journey begins with a green screen where a certain Kryptonian is missing and you must strike your best hero pose to be his stand in and after that quick introduction to the League I am ushered into a room set in Paris. 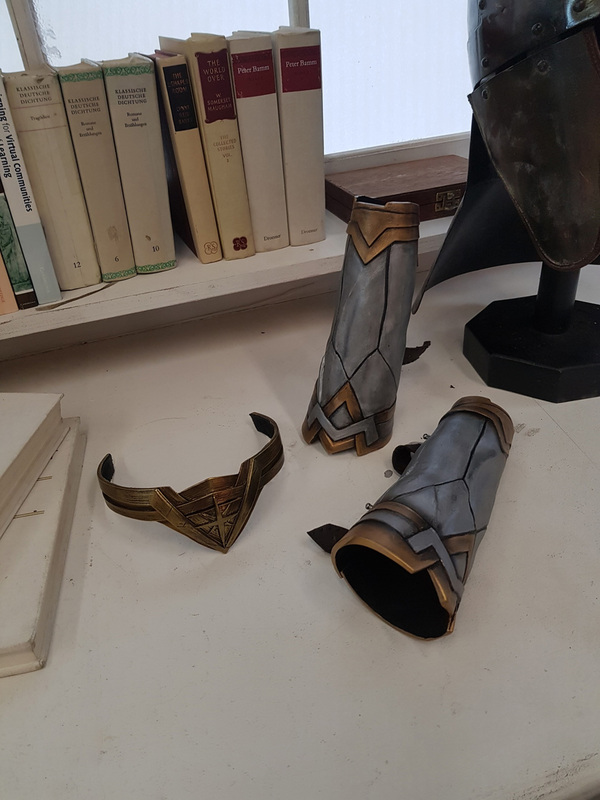 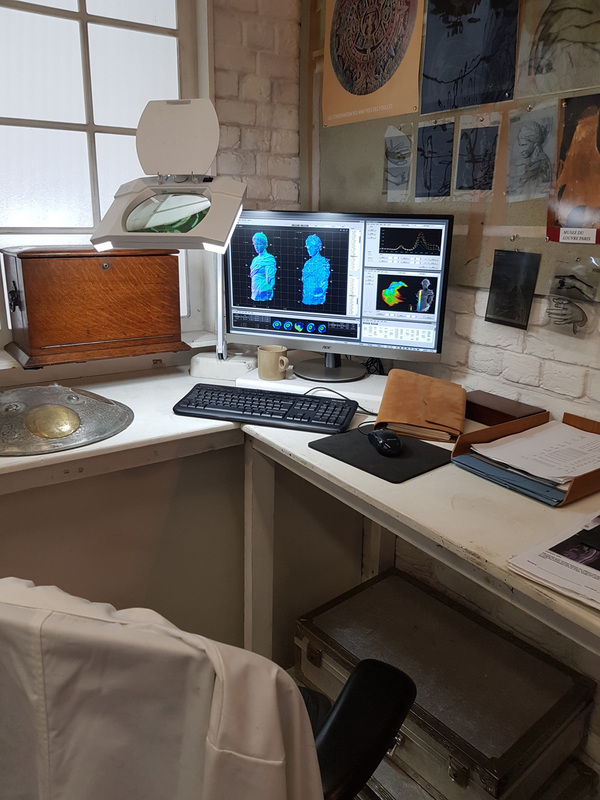 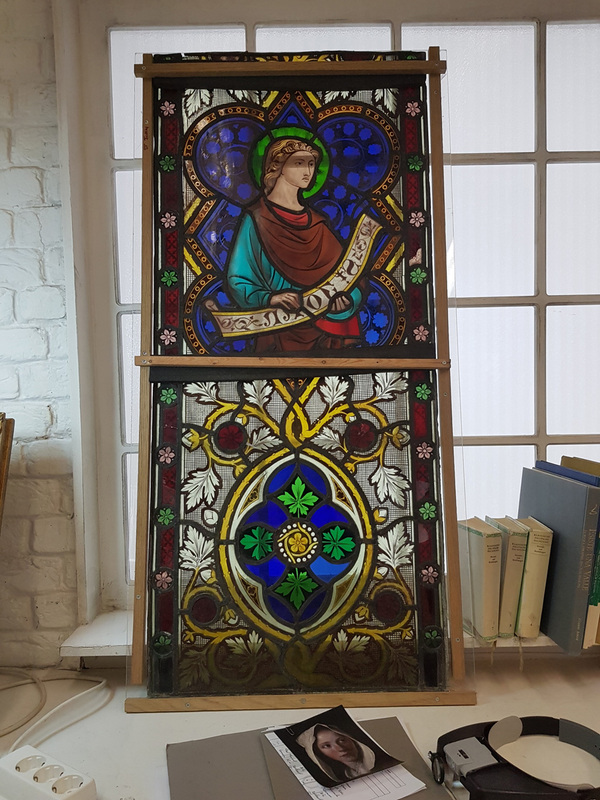 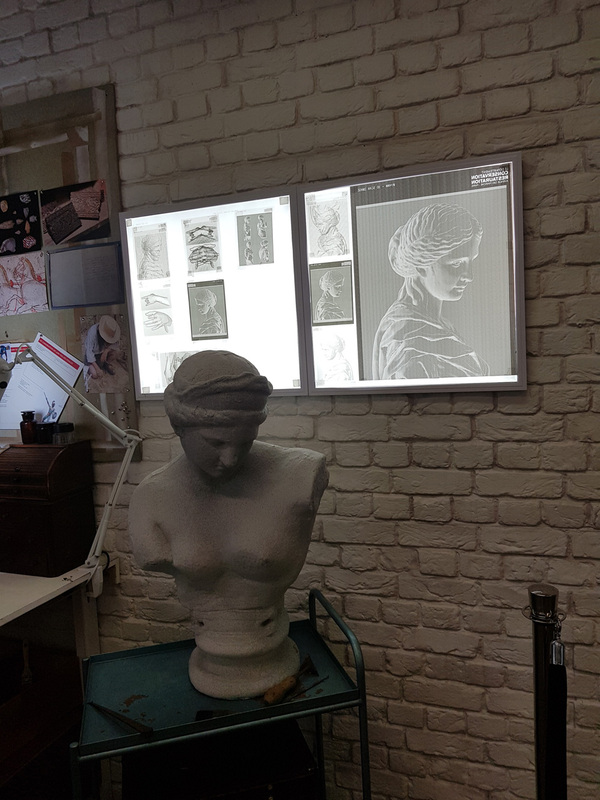 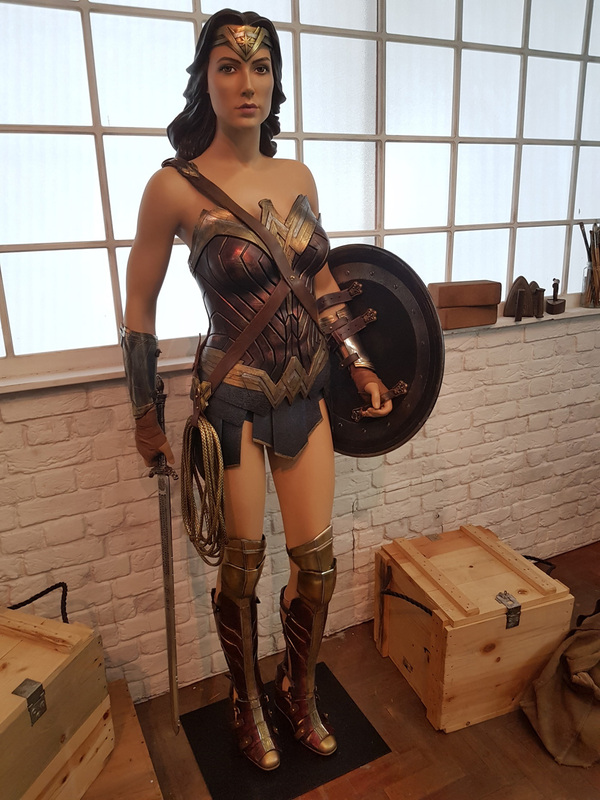 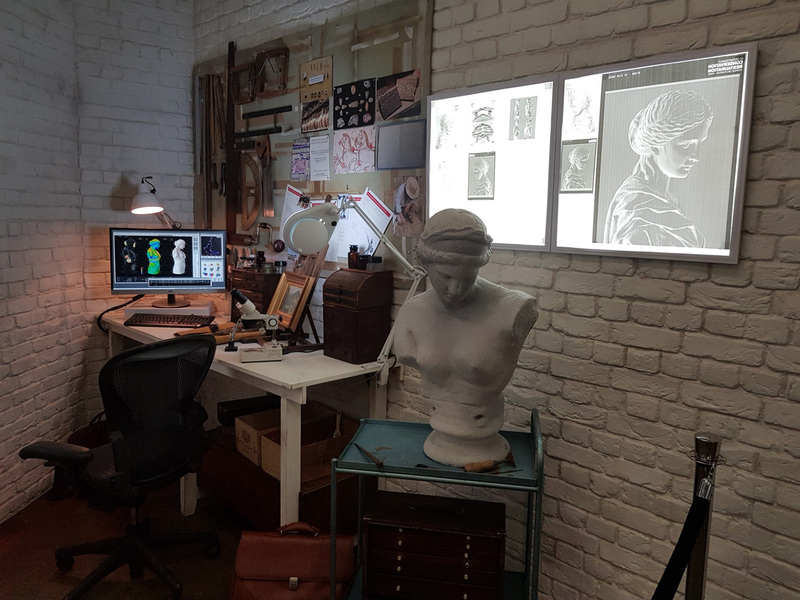 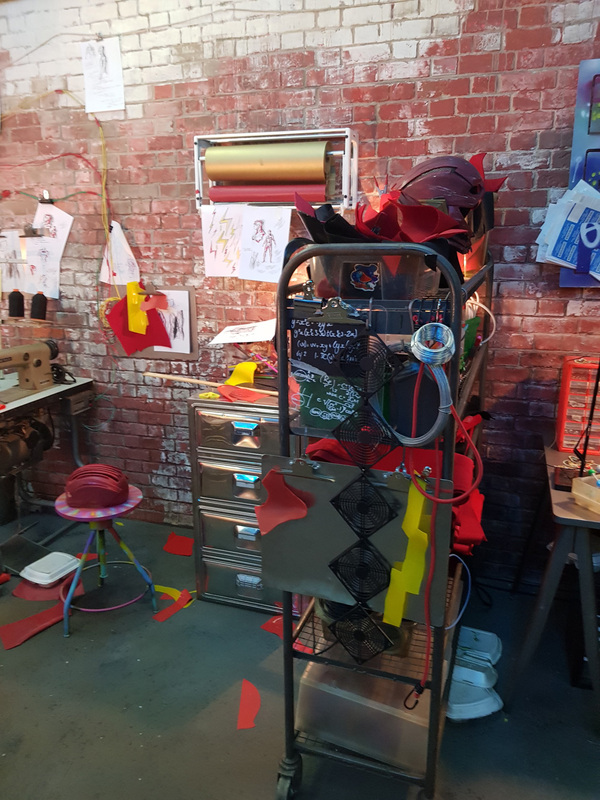 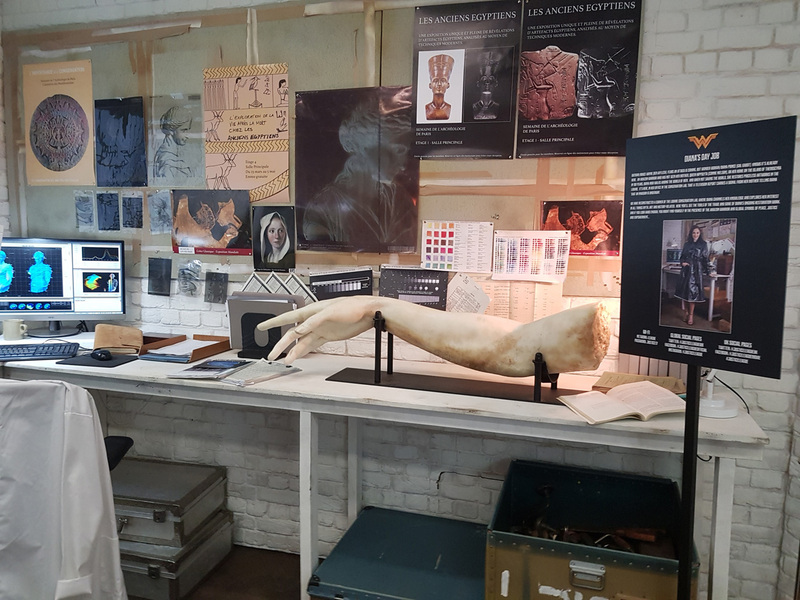 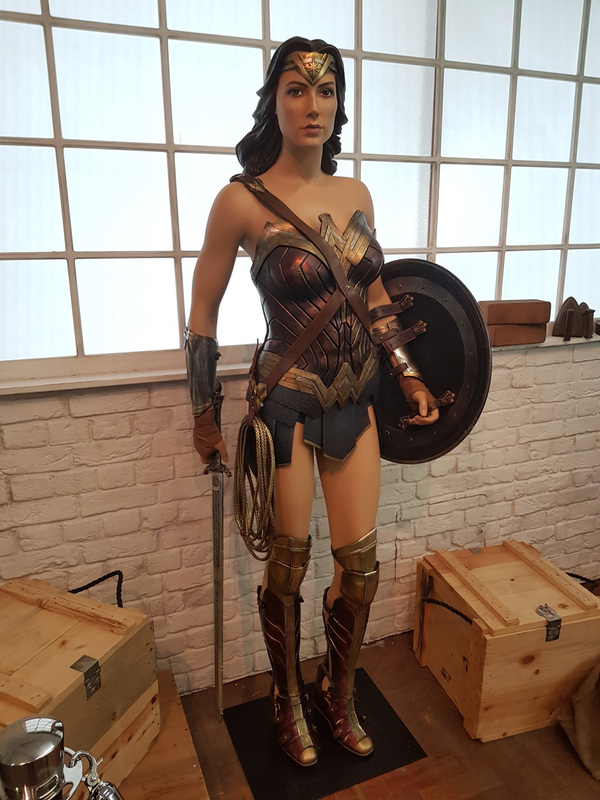 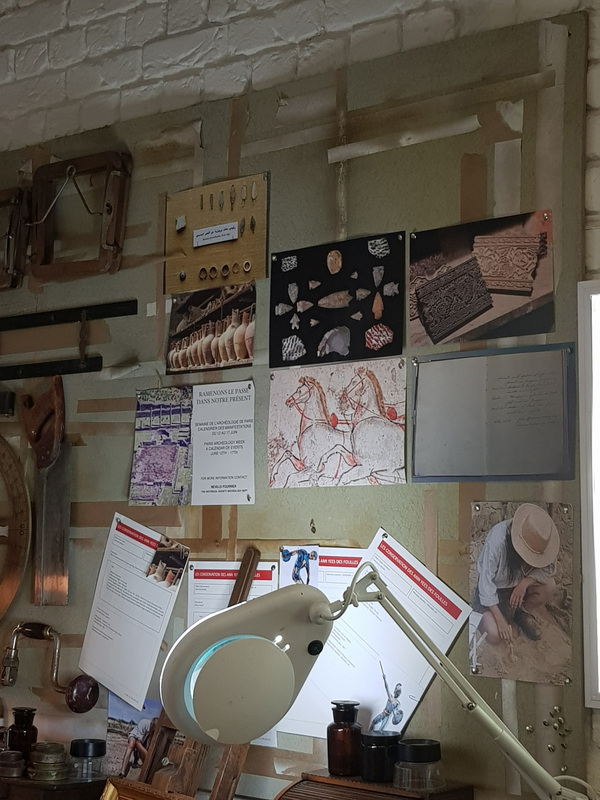 Here is Diana’s restoration studio, adorned with statue fragments, drawings, photos, stained glass and as the centerpiece Gal Gadot’s actual costume. 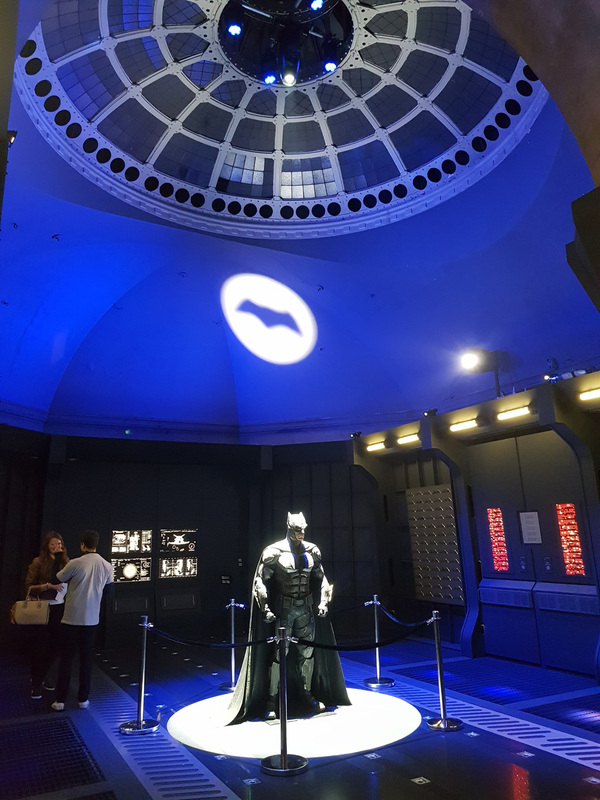 Next stop is Gotham City. 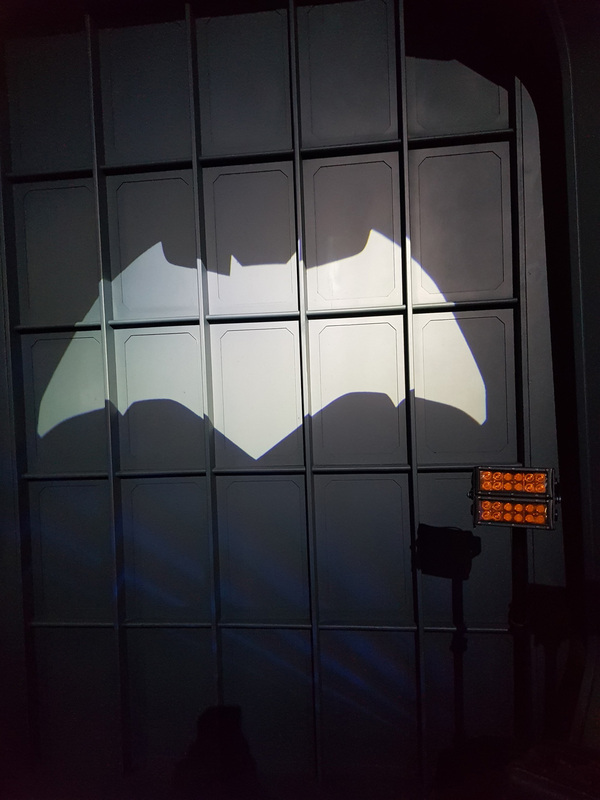 I walk down a metal ramp directly into the Batcave. 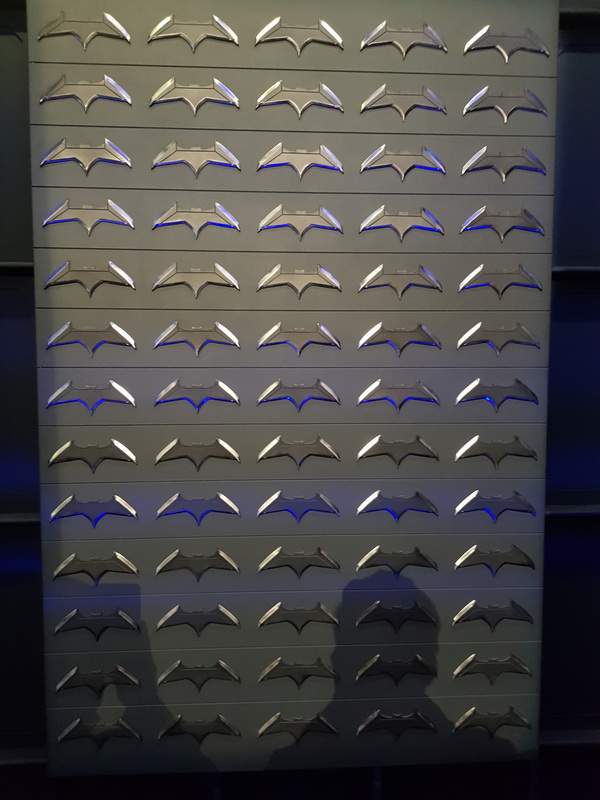 Here, the bat signal races across walls of batarangs. 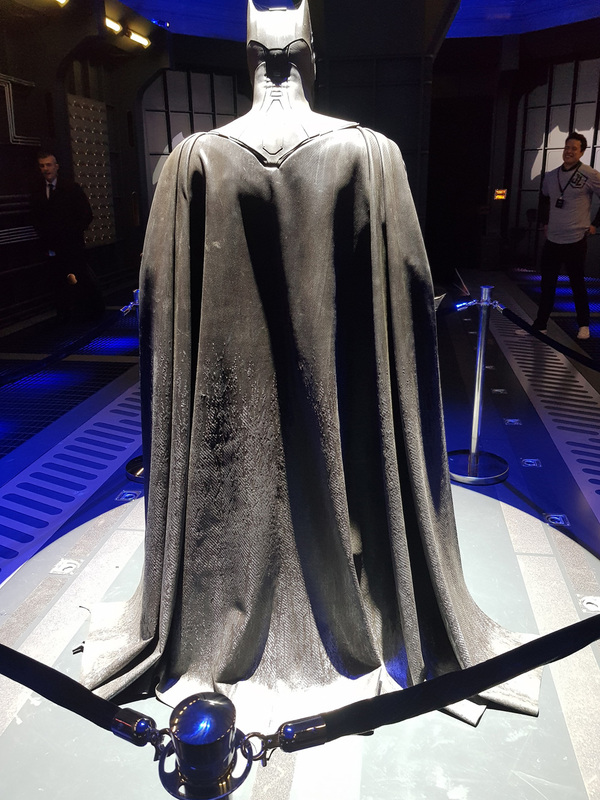 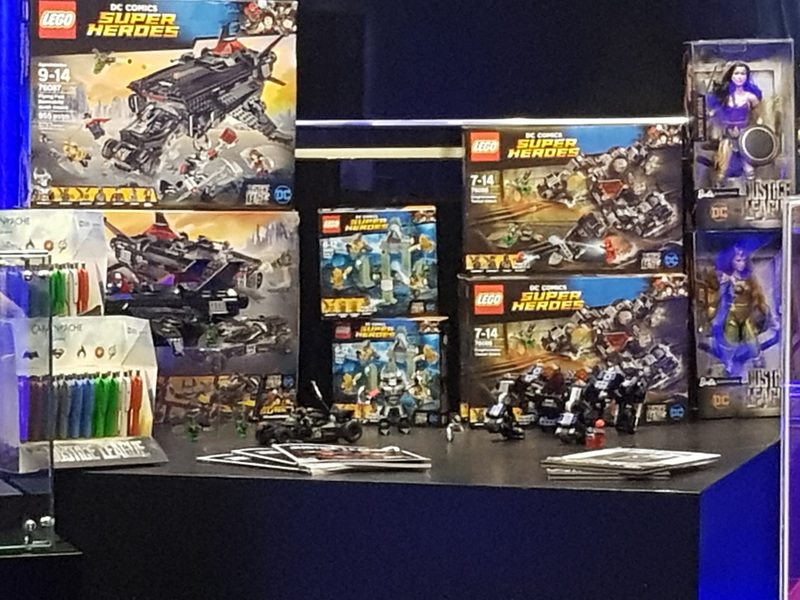 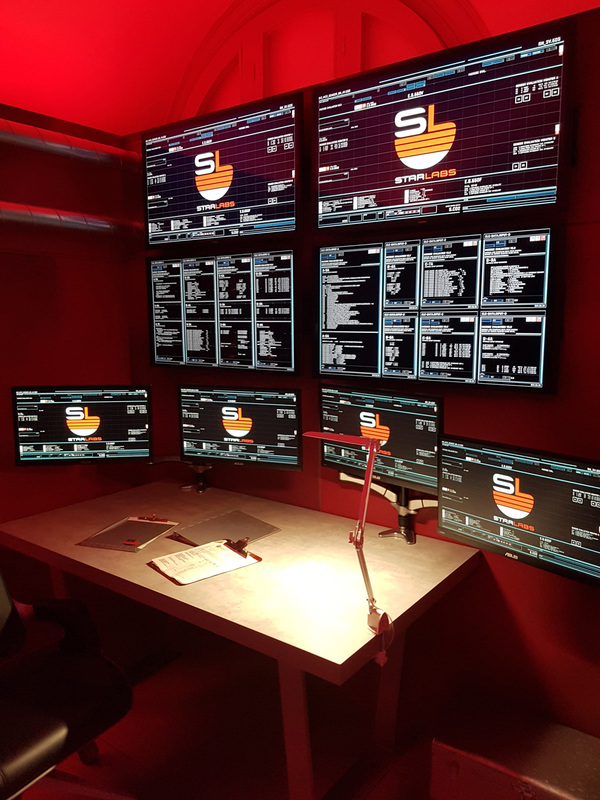 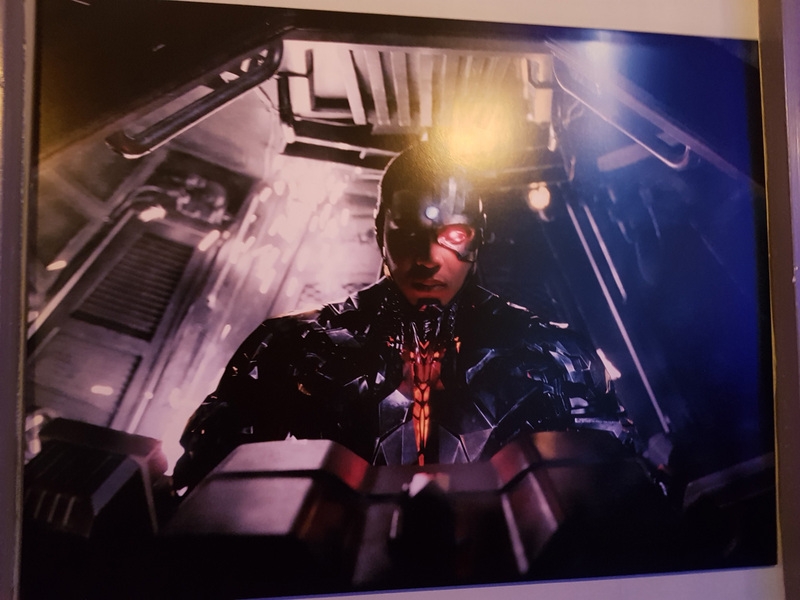 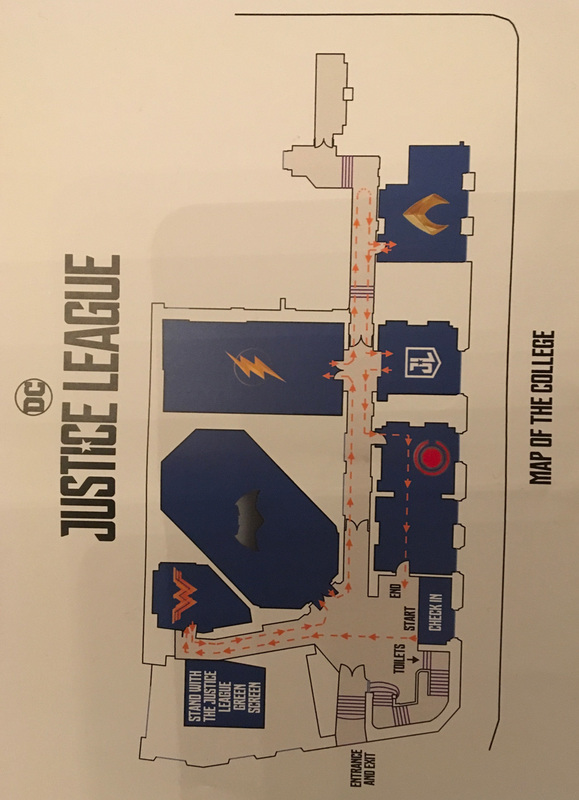 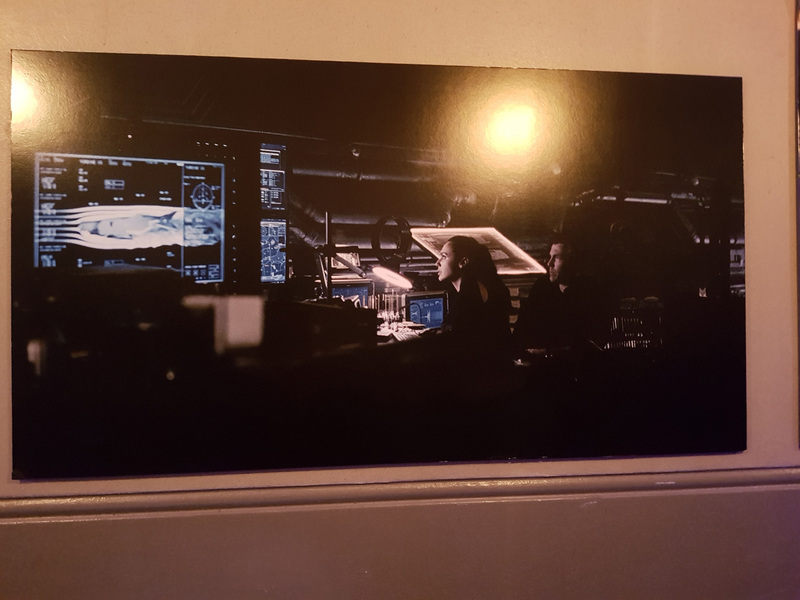 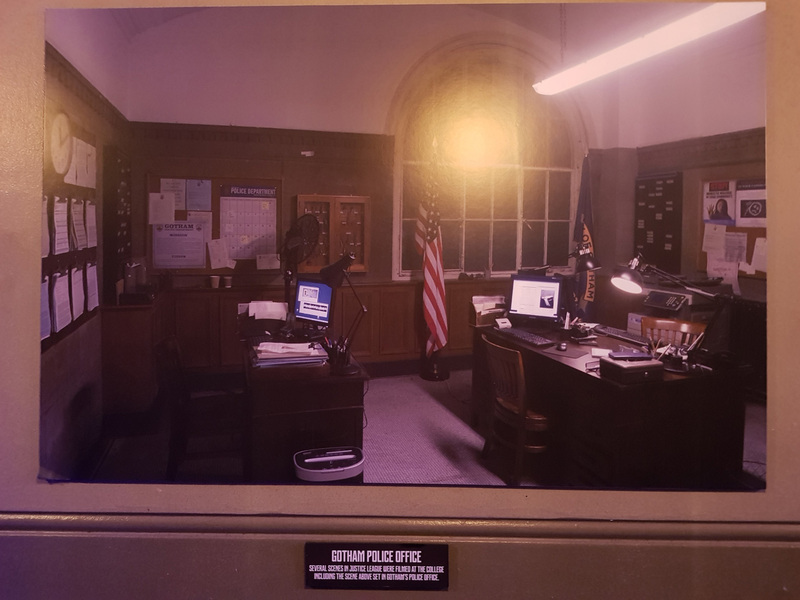 There is the batcomputer running schematics and Ben Affleck’s newest costume is the centerpiece. 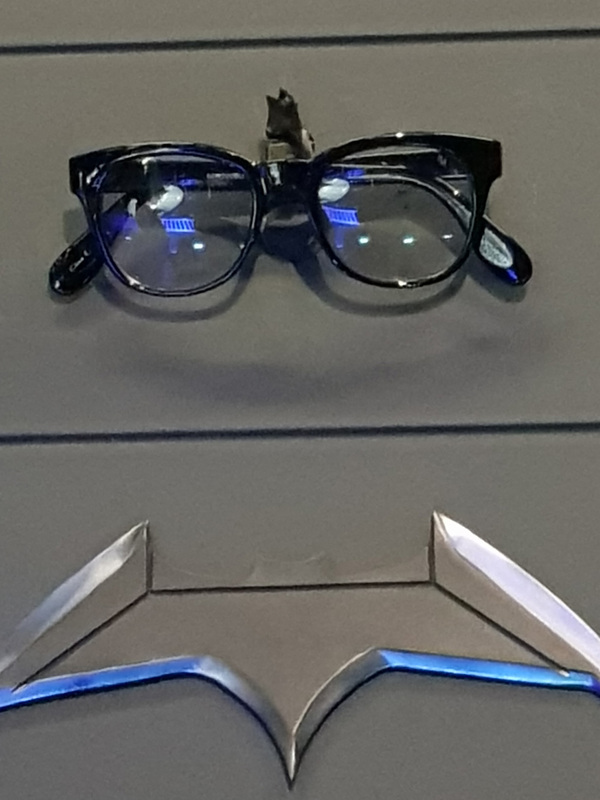 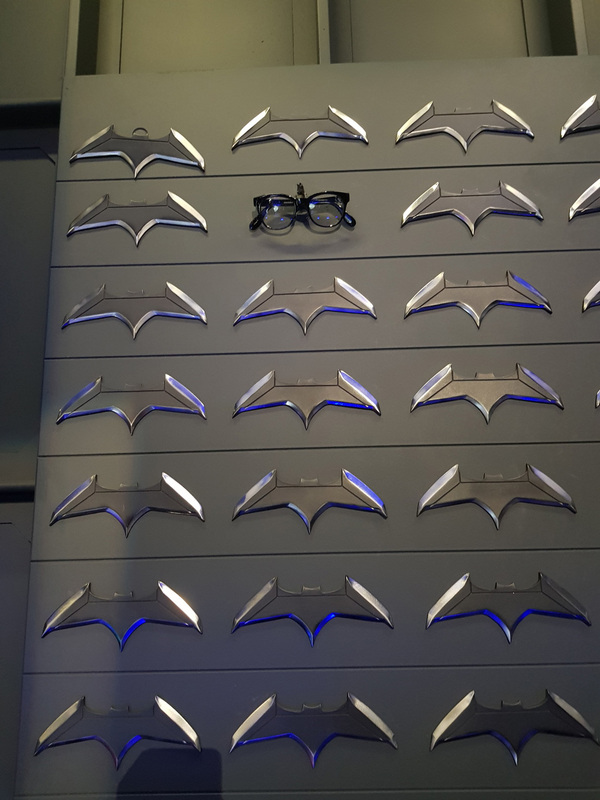 There are literally hundreds of Batman’s razor sharp throwing weapons and something hidden away (I’ll come back to it). 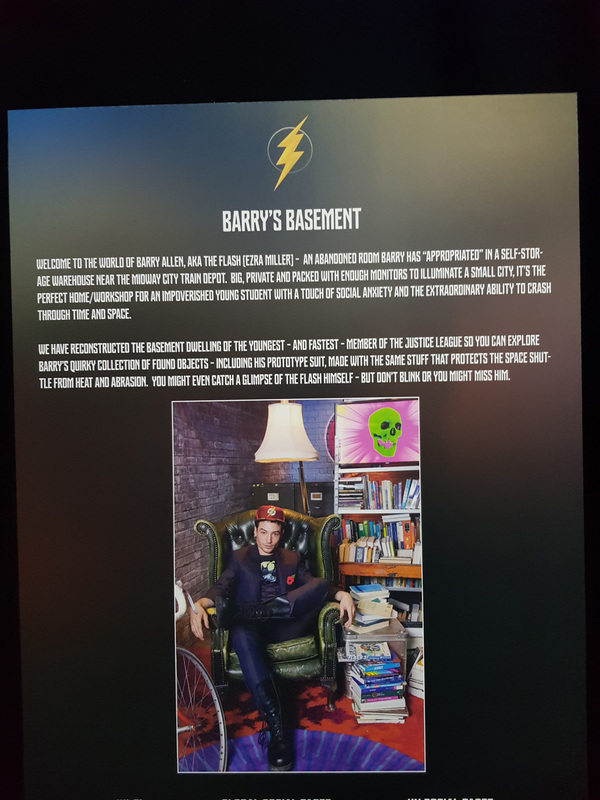 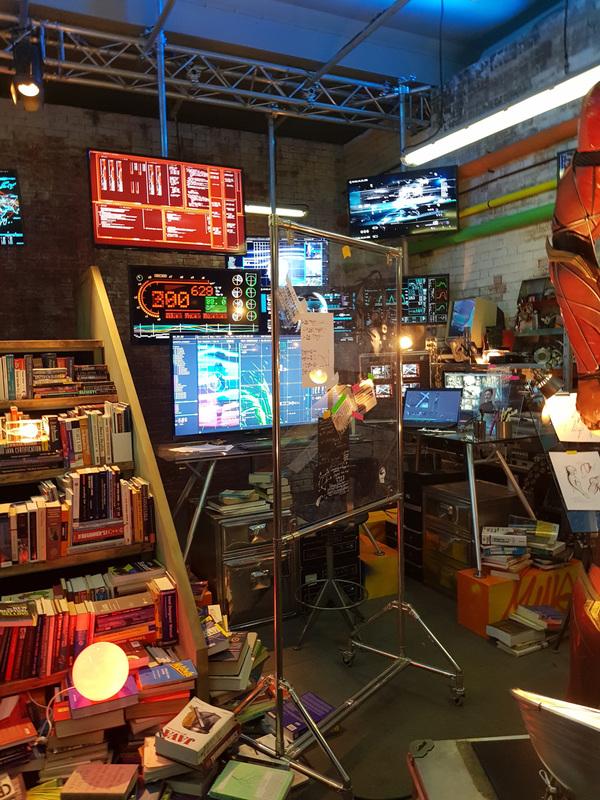 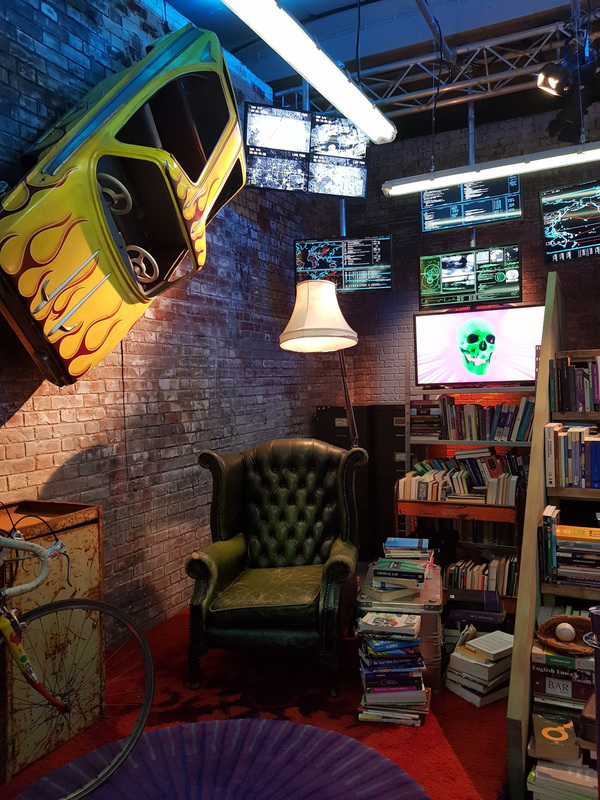 Then to Central City where Ezra Miller’s suit, a variety of helmets and extensive library of books are stacked all over the loft. 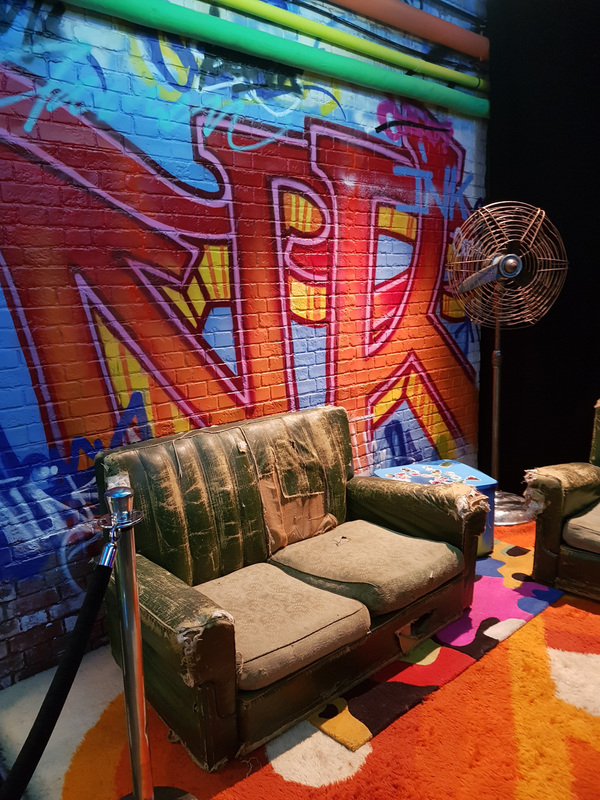 Graffiti emblazons the walls as does Barry’s car. 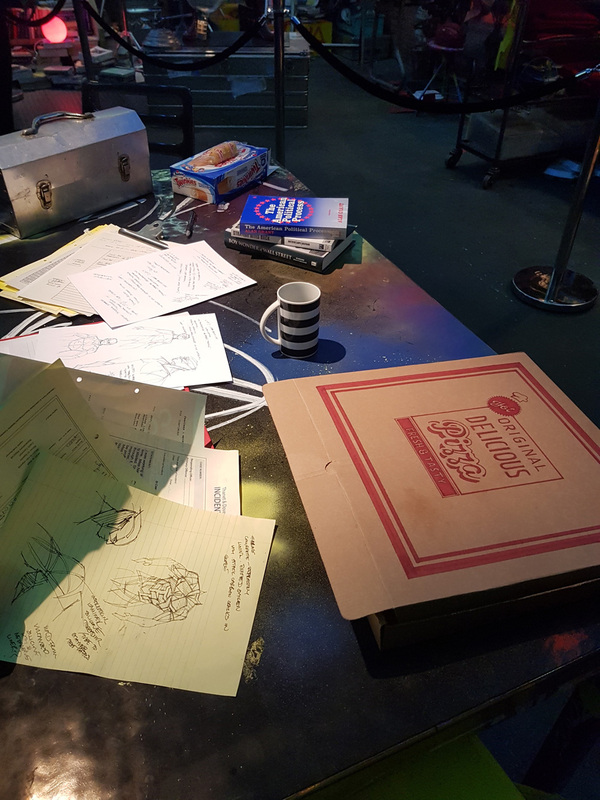 On a desk littered with take out boxes are Barry’s costume sketches. 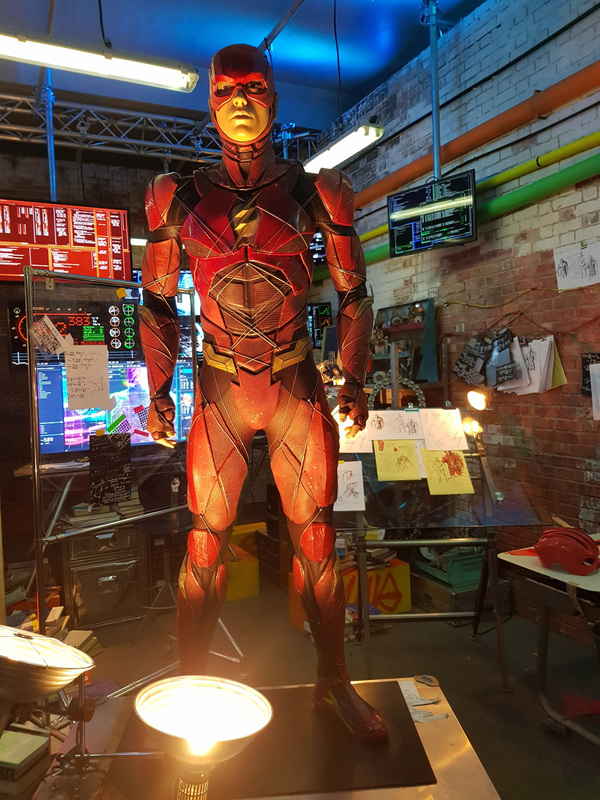 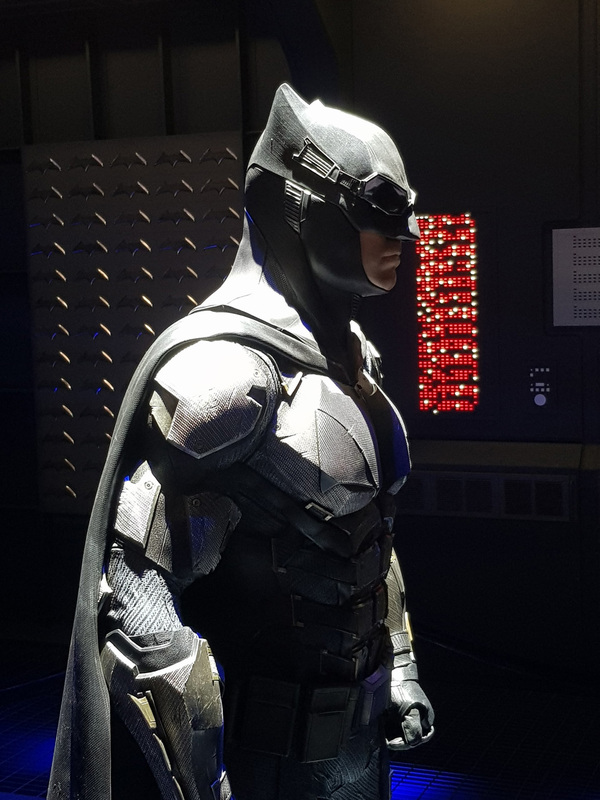 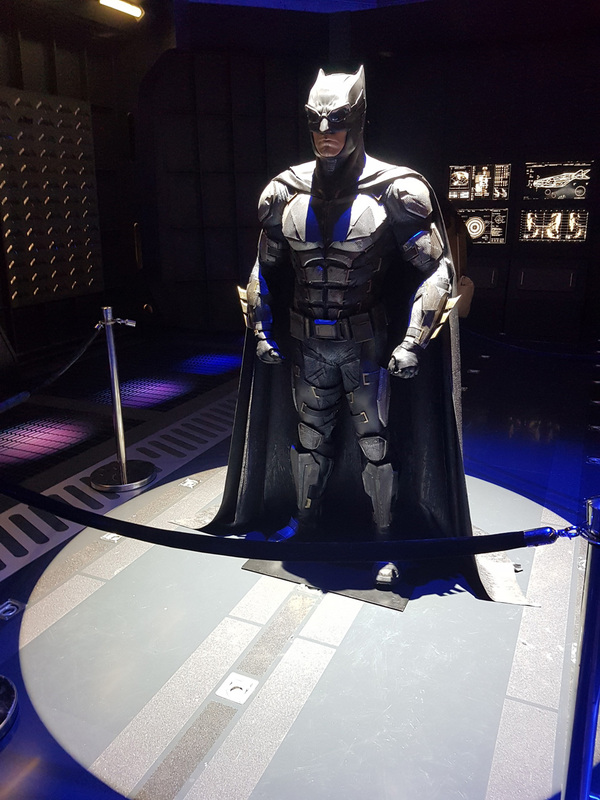 The suit in person looks very different than in early stills. 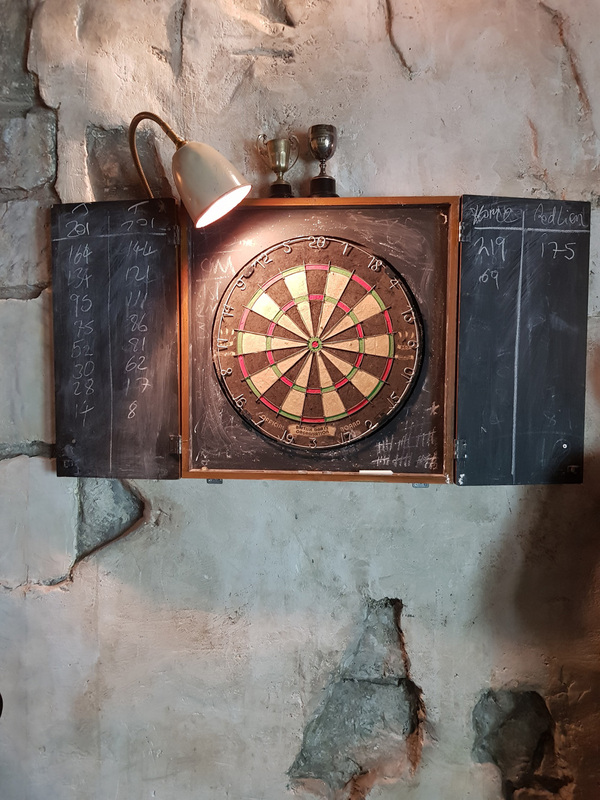 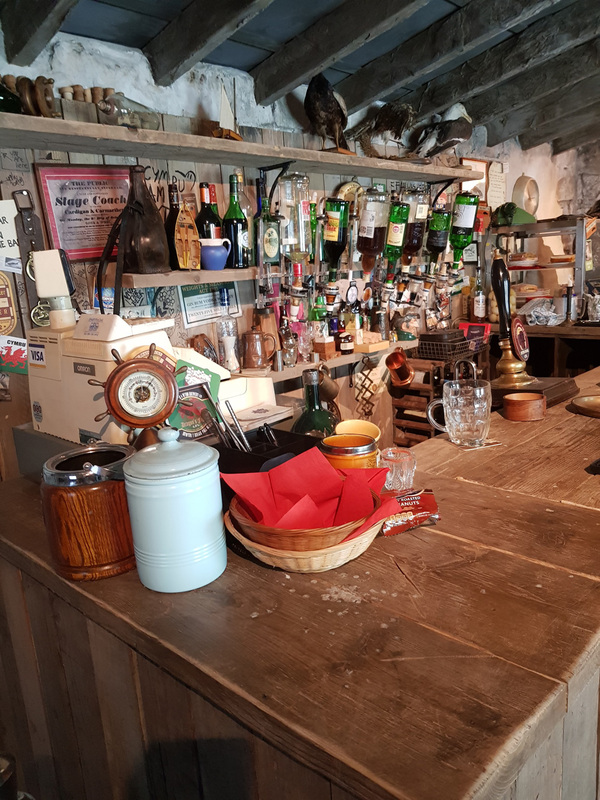 The globetrotting continues as a cosy bar in Iceland is the next stop. 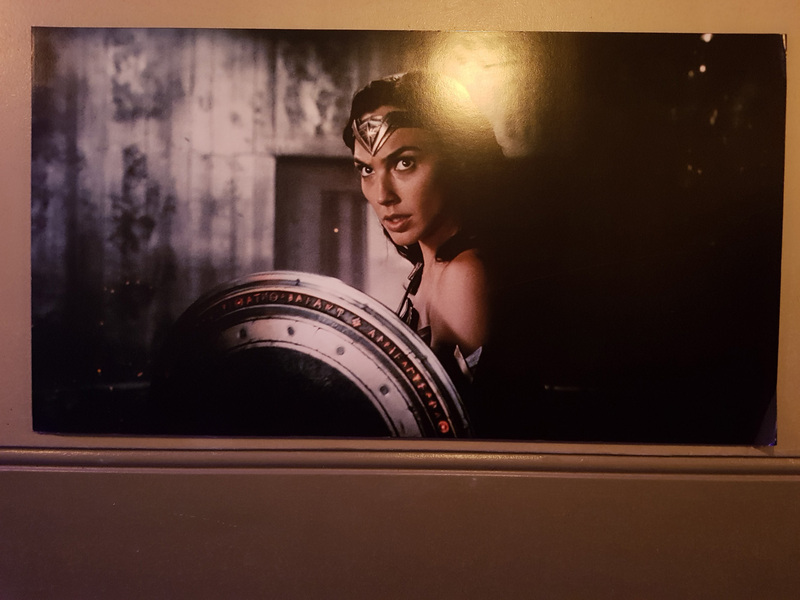 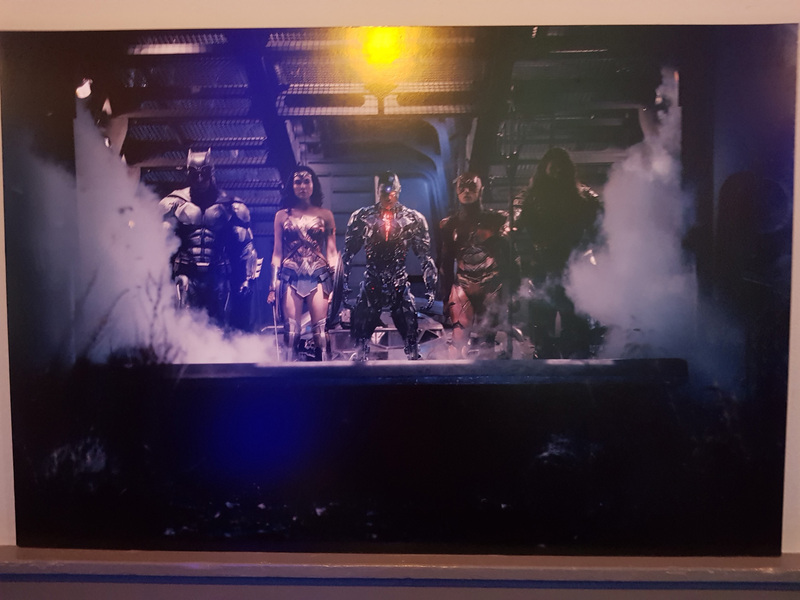 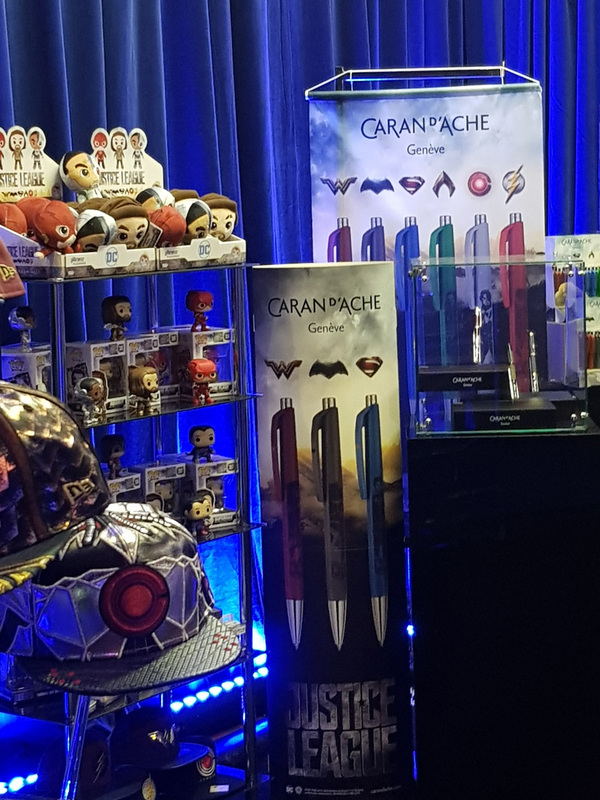 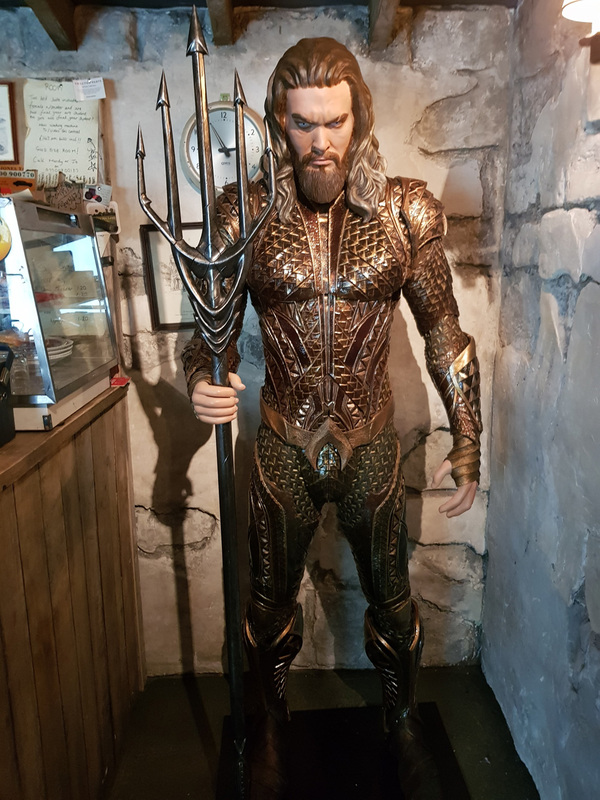 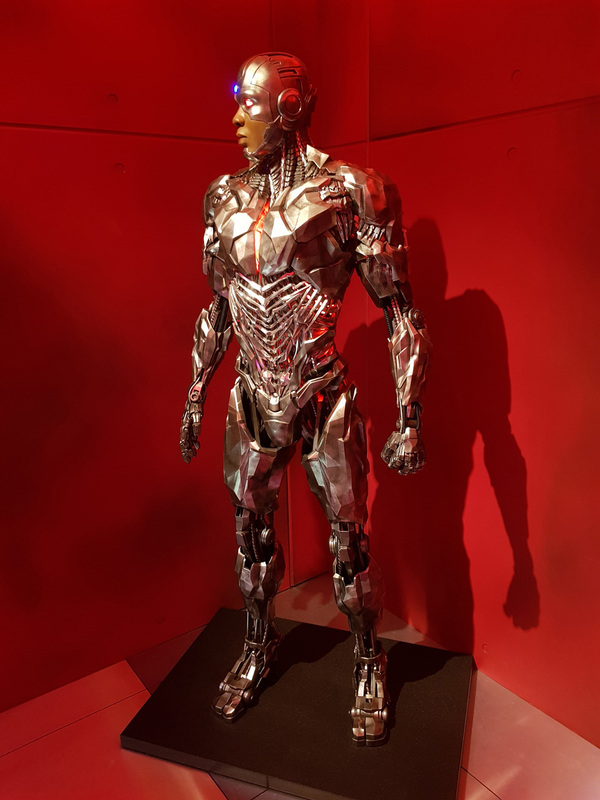 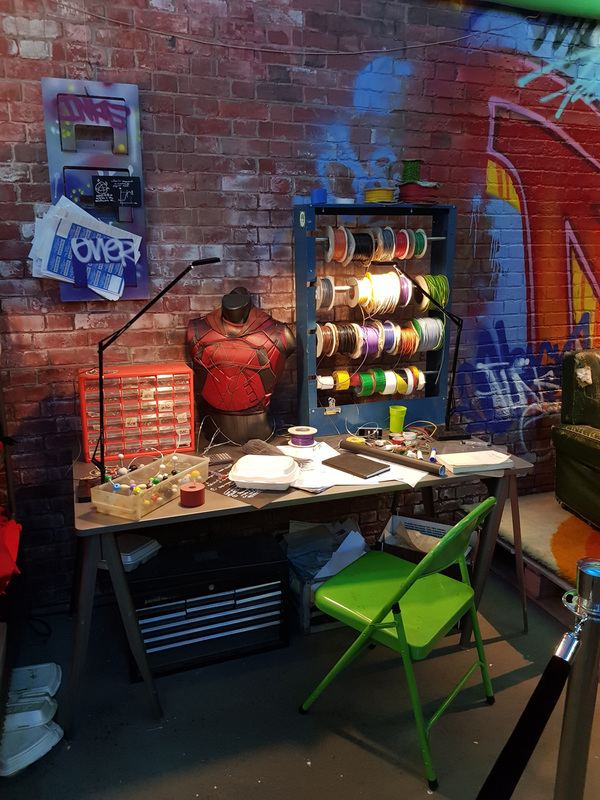 There are tiny Easter eggs to be seen and hidden in the corner is a Jason Momoa mannequinn with a very sharp trident and a beautifully detailed suit of armor. 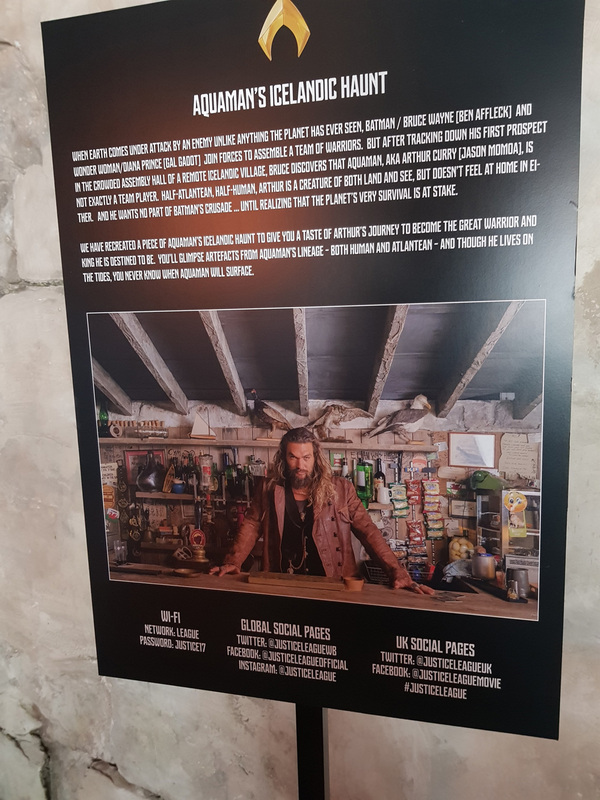 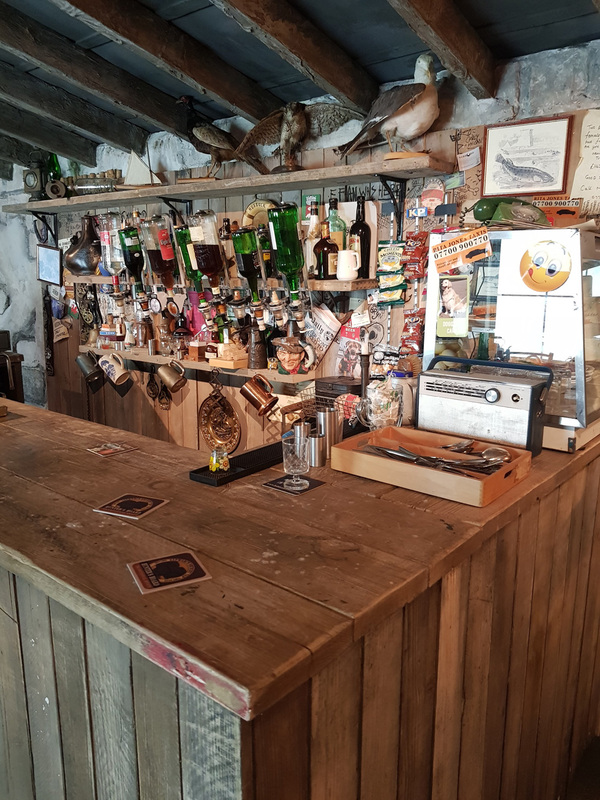 It is very strange to know every bottle in the bar, every glass, and postcard was really in the film. 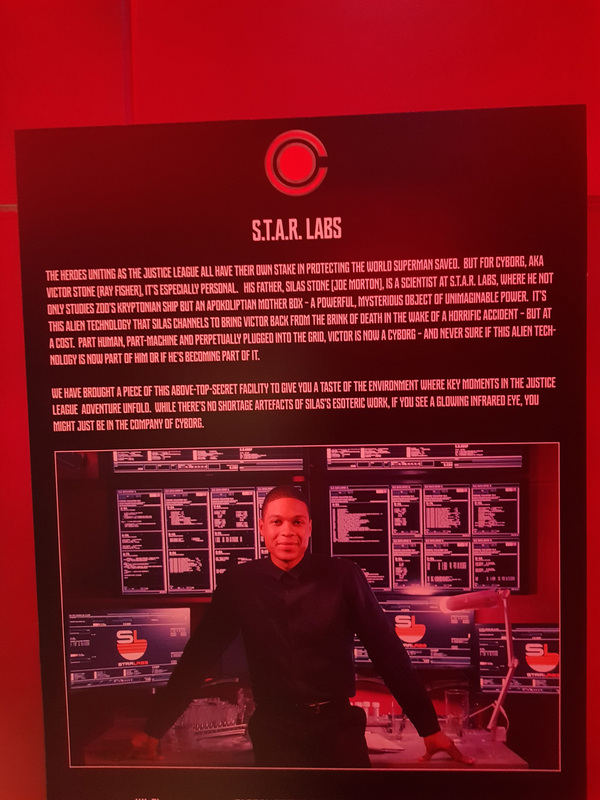 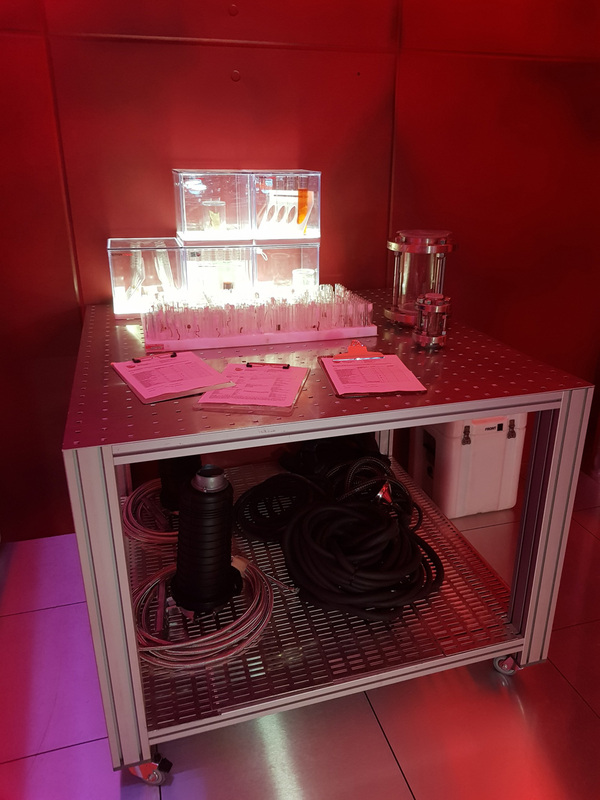 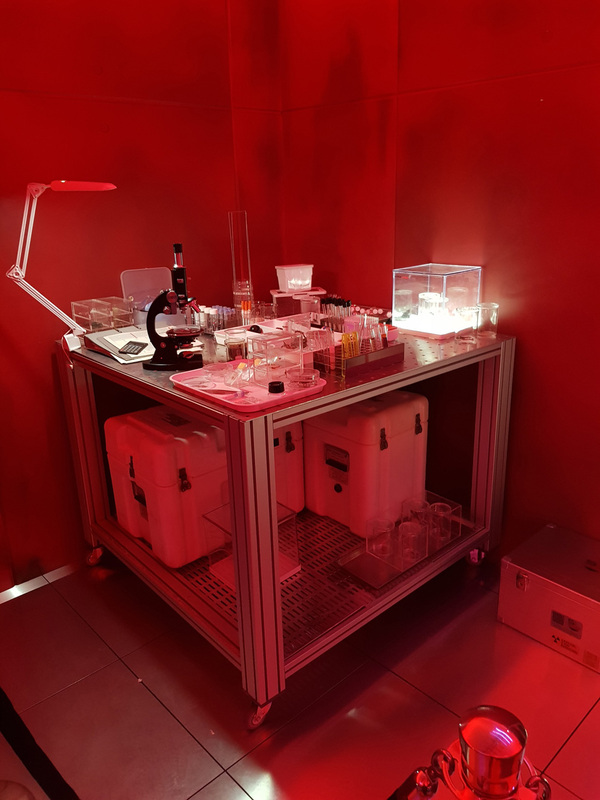 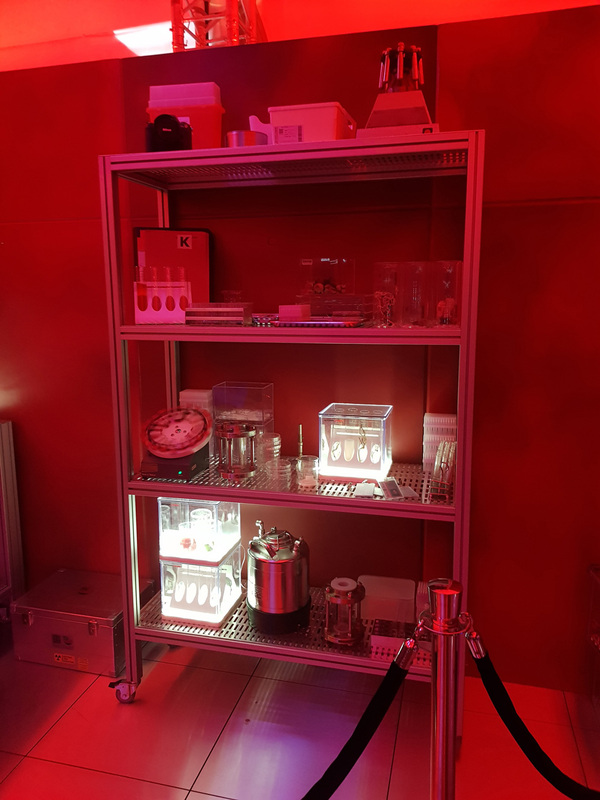 Detroit is the next stop and the cold sterile room that is Victor Stone’s lab. 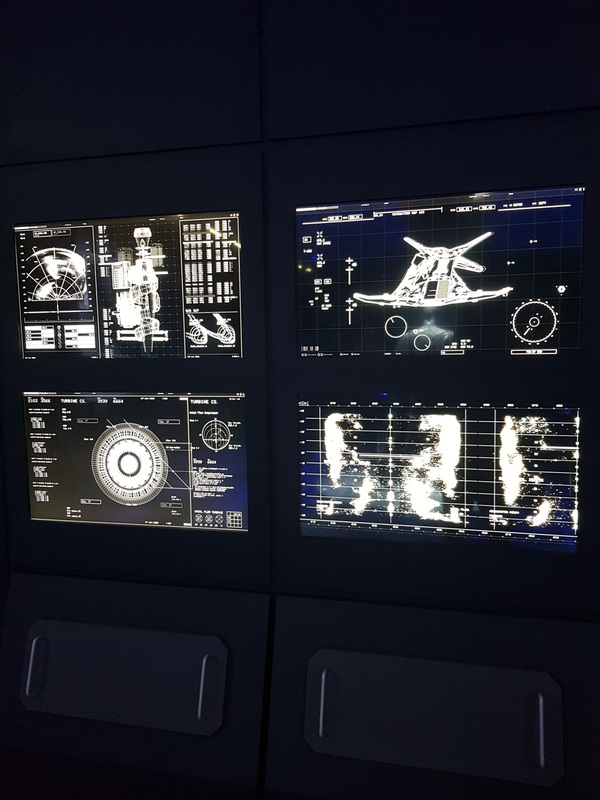 Huge data servers and screens process data and at the centre stands a Cyborg. 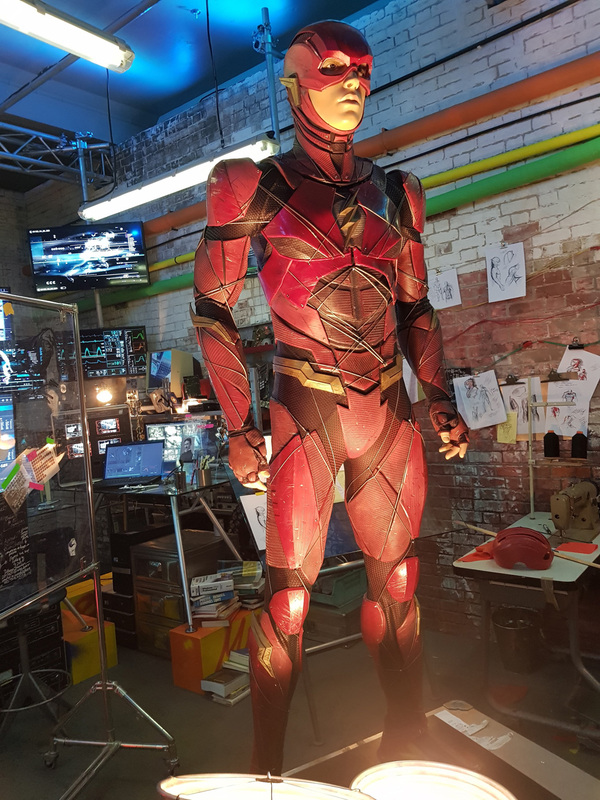 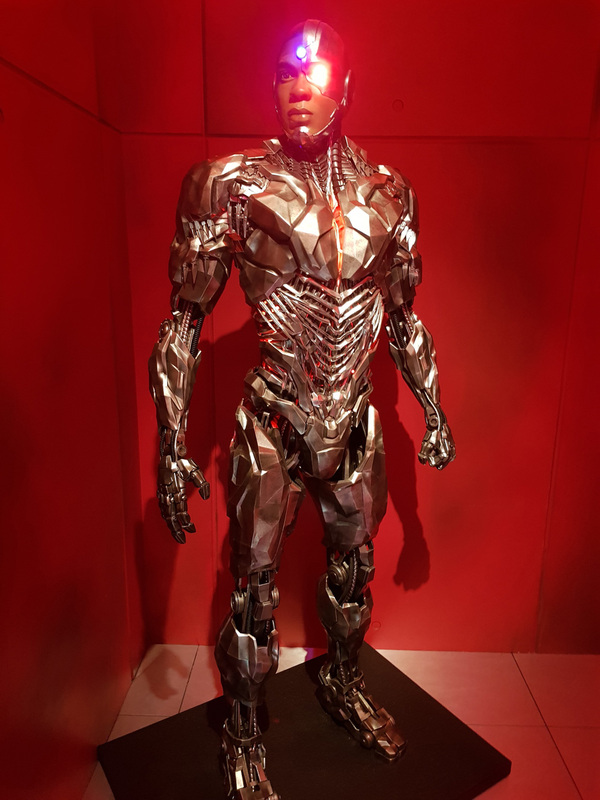 Having seen only the CGI before this, to see the real suit, close up, it is quite something. 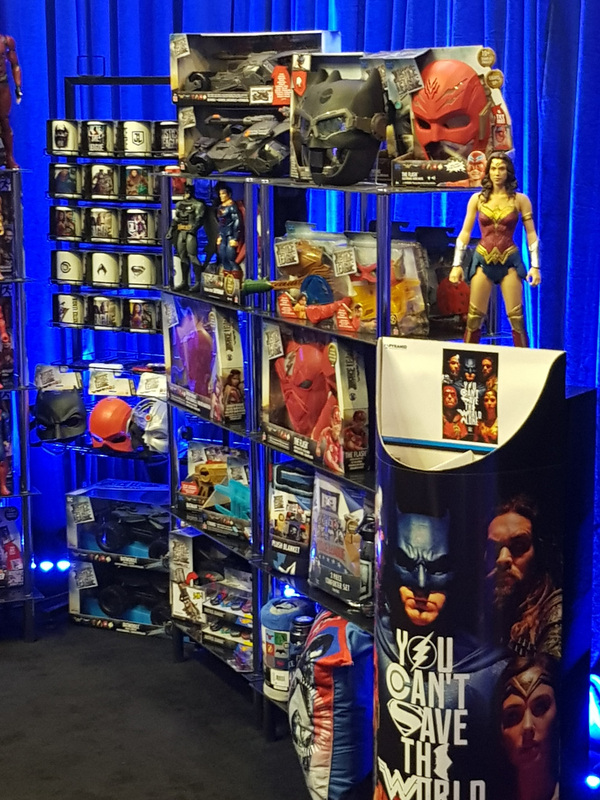 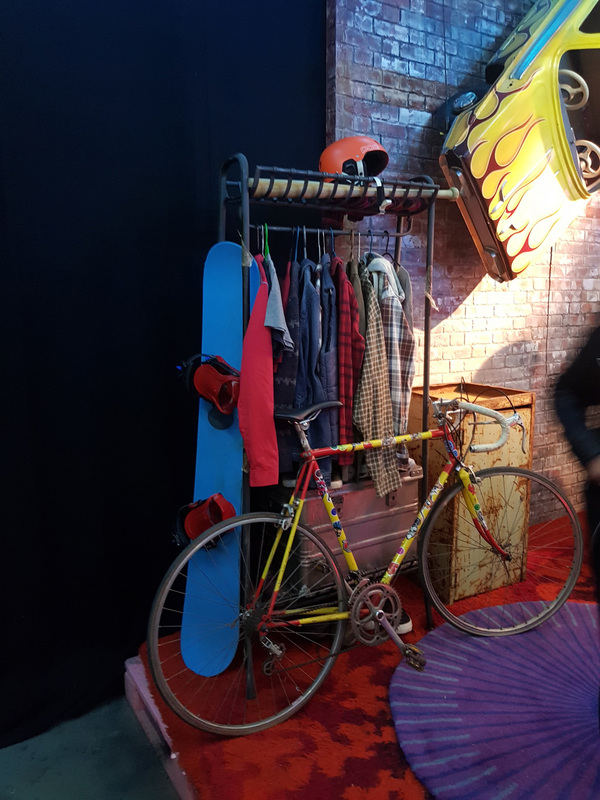 The final room is the merchandise display. 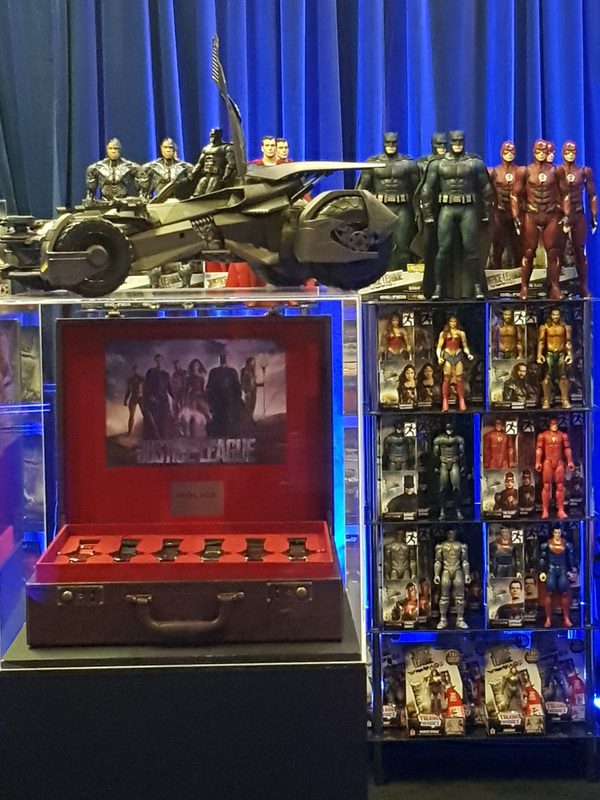 Everything from watches to lego, t-shirts to games. 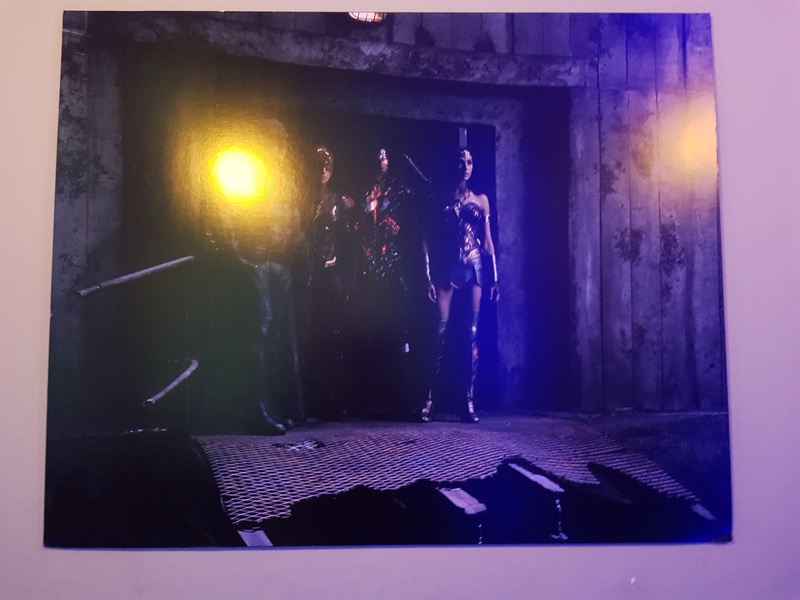 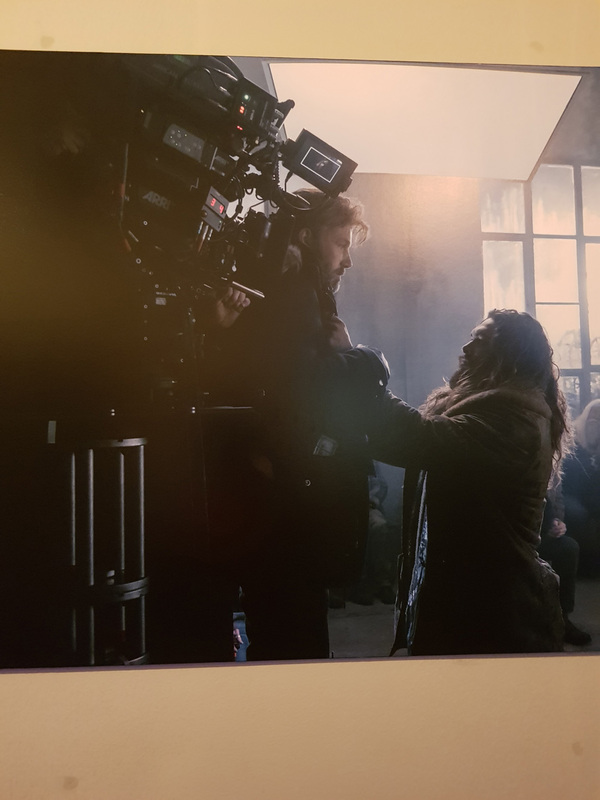 This room wasn’t ready so I could only take pictures from a distance, apologies for the quality!